This summer, eight artists on the faculty roster of Herron School of Art and Design at IUPUI will be featured in the curatorial debut of Indianapolis-based art collectors Christopher Slapak and Michael Robertson at one of Chicago’s premier contemporary art galleries. “Chicago and Indianapolis – What’s the Connection?” is the title of a group show at the Zolla/Lieberman Gallery in Chicago (July 14 through August 16), highlighting pieces by Anila Quayyum Agha, Ray Duffey, Valerie Eickmeier, Reagan Furqueron, Marc Jacobson, William Potter, Melissa Parrott Quimby, and Andrew Winship. 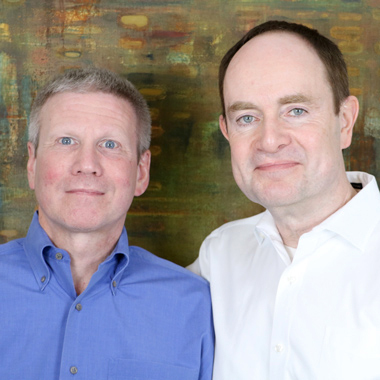 Slapak and Robertson are both oncologists by training and avid art collectors. Even as young medical students at the University of Chicago where they met, the couple always had a passion and an appreciation for art. When travelling to cities such as New York, Los Angeles, San Francisco or Chicago, visiting galleries is one of their primary pastimes. Over the years, Slapak and Robertson have amassed an impressive collection of abstract, contemporary art that graces both their 100-year-old Meridian-Kessler home in Indianapolis and high-rise condominium in Chicago’s Gold Coast. In the course of their collecting, they have built relationships with a number of artists and art dealers such as William Lieberman, second-generation owner of the Zolla/Lieberman Gallery. It was Lieberman who pitched the idea of curating a show to Slapak and Robertson. The inspiration for a Herron faculty group show hatched during Lieberman’s visit to the school for a guest lecture by artist Deborah Butterfield, whom he represents. He felt a strong connection to Herron School of Art and Design and Indianapolis during his visit, and sought to feature the work of select faculty in his gallery. Despite never having curated a gallery exhibition, Lieberman felt Slapak and Robertson possessed the “the vocabulary, the knowledge, the connections, and the vision” to meet the challenge while giving Herron a chance to shine in the Windy City. Although they had previously visited the Herron Galleries on the IUPUI campus, the Summer 2016 Faculty Exhibition was their first introduction to the work of 35 visual artists currently teaching at Herron. “We were not familiar with the work of the Herron faculty before taking this project on,” said Slapak. In selecting the artists and pieces for “What’s the Connection?”, Slapak and Robertson were struck and engaged by the faculty’s passion for the facture, the making, the quality of the workmanship, and the emphasis on craft. It’s an artist’s story that, in part, drives the couple’s passion for art and art collecting. “It’s very interesting to hear the perspective of an artist when they are describing their work or why they developed in a particular direction, what led them to go there. We find those conversations fascinating,” said Robertson. Featuring the work of contemporary artists also fits within their collecting priorities. The couple would rather buy from a working artist for their collection. Herron Dean Valerie Eickmeier is among the faculty whose work will be included in the show and attributes the faculty’s work as professional artists in helping prepare generations of students for careers that require creativity, critical thinking skills, and technical capability. “Herron’s faculty have exhibited their work broadly throughout the United States and internationally, earning awards, commissions, and grants. They excel in their studio practice and serve as excellent role models to aspiring artists and designers,” said Eickmeier. Robertson points out that there are some famous art schools where the emphasis is on theory and less on producing art. At Herron, the faculty are focused on preparing artists to become professionals. The bottom line for Robertson, “These people know how to do it and can teach you how to do it." Who: Anila Quayyum Agha, Ray Duffey, Valerie Eickmeier, Reagan Furqueron, Marc Jacobson, William Potter, Melissa Parrott Quimby, and Andrew Winship. Curated by Christopher Slapak and Michael Robertson. When: July 14 to August 16, 2017. Opening Reception: July 14, 5:00–8:00 p.m.